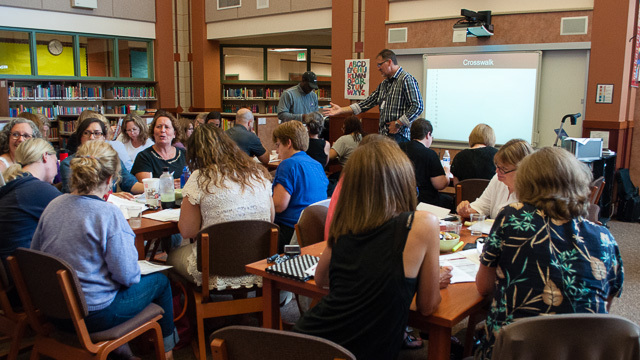 The workshops were broken up into four sections, with each building upon the previous, ultimately resulting in all the information being brought together in a way that allowed educators to apply their knowledge in their schools this year. Each section included a presentation on the topic and plenty of time for colleagues to discuss and apply the information in the context of their own schools. The introduction reviewed why educators are feeling overwhelmed and what has been the cause of all the change (college and career readiness and the new focus on teaching and learning, rather than just the historic focus on curriculum and assessment). This section introduced the importance of clarifying terms around instruction (for example, "instructional strategies," "instructional models," "instructional frameworks," and "professional practices frameworks") and where they fit into a teacher's work. Most training on the evaluation system has focused on the details of the frameworks. This section focused on the need for starting with a focus on the big ideas behind the State Evaluation Criteria and then working into the evaluation model details by operationally defining the criteria and focusing on three core instructional habits. Lastly, attendees practiced focusing on one of the three instructional habits by watching a classroom clip and following the STAR Process. Attendees at the Issaquah workshop discuss how focusing on key areas of instruction simplifies the teacher evaluation system. "Pulling everything together made sense after a year of meetings that only heightened confusion and anxiety." "This workshop brought [the reforms] home for the team. It was all about making connections." "It was a valuable workshop that gave me time with my colleagues to make sense of the wide variety of reforms." Race to the Top, NCLB Flexibility Waiver, Digital Curriculum Adoption, Student Growth Measures, Evaluation Frameworks, TPEP, Common Core, Smarter Balanced... How to make sense of it all, by keeping it simple!